With the release of their glorious scent Guilty in the bag, Gucci is treating us again – and wouldn’t you know, it’s just in time for Christmas! We’ve all been there; it’s 8:45 and you’re running late, you start work at 9 and you’ve barely got time to run a brush through your hair let alone locate your favourite scent. Instead of feeling a little bit lacklustre all day you remember that – being the genius that you are – you stashed a secret weapon in your bag: a purse spray full of uplifting scent. And just like that, your day gets a little bit brighter. Just like a slick of lipstick, fragrance can really make you feel ‘done’. To suit busy lifestyles, Gucci repackaged their four latest and greatest scents for a sumptuous little lift from the office to the bar and everywhere in between. 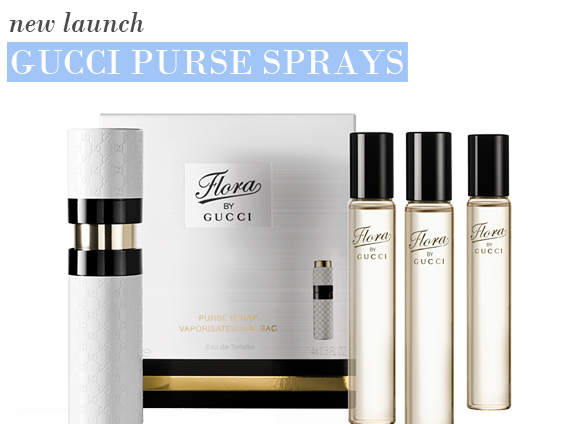 The four sets each include a gorgeous metal outer casing that is small enough to slip into a clutch, a pocket or a make-up bag, each with four easily interchangeable vials of 15ml scent. The ultimate in sleek portability, they’re perfect for when you’re on the go, day or night. This heady and opulent scent is the personification of Gucci. With its time-honoured brown monogrammed print and gorgeous touches of gold, the metal casing is instantly recognisable. The hypnotic fruity scent has touches of floral and gourmand notes, before settling on a swirling musk and patchouli base. Pure luxury for night-time wear. The Gucci by Gucci Eau de Toilette is a lighter, more carefree variation of the original Eau de Parfum; but it’s no less enchanting. Instead of burnished brown, the metal casing is a monogrammed blushing pink, rendering it an altogether more girly offering. The lighter fruity scent sweeps in waves of florals and musks, perfect for daytime wear. A dreamy scent from the Gucci powerhouse, as light as a feather with a more intoxicating heart and base. A swell of citruses at its opening are made sweet with touches of pink florals, and rendered unforgettable with a base of pink pepper and sandalwood. A gorgeous signature scent to sweep you up in romanticism all day long. Audacious, enticing, and always at the centre of the action! The brand new Guilty scent demands to be worn, with scintillating citrus notes, creamy florals and a seductive patchouli and amber base. The sleek black metal casing together with the vivid gold stamp of the Gucci House makes this a gorgeous clutch bag scent to incite some serious envy! Excellent customer service. Ordered and delivered within 3 dayseven though scotland was covered inheavy snow. This entry was posted on Wednesday, November 10th, 2010 at 10:53 am and is filed under Fragrance, Gifts. You can follow any responses to this entry through the RSS 2.0 feed. You can skip to the end and leave a response. Pinging is currently not allowed.